With the latest league of drones and their reliable features, consumers now want ease of portability and compact design, too. And, the Mavic Pro from DJI delivers that. The days of a drone taking up half of the trunk of your car are gone! This fantastic unit folds up to a very compact size and also packs loads of features. But can portability and functionality work in the same package? This Mavic design has been totally overhauled with portability in mind. Having everything fold down to something that you can fit in your hand is very impressive, with folding arms and propellers. It also has a very compact controller making work in ariel video and photography a breeze with quality results. They say what goes up has to come down. In terms of a drone, that means you need something that is built extremely well. The hull is tough enough to take a fall onto a grassy area without damage – just needing a reset – but, don’t think this unit is bombproof. You will still have to take very good care of it. You may need to replace a few props every so often, but that’s better than than replacing the whole unit. Having a foldaway system means that you can take it anywhere, such as in a small backpack. The controller is extremely portable with flip out antennas that allow you to fit a smart phone for visual feedback. To keep everything sturdy and level, the drone utilises DJI’s ActiveTrack and Optical Flow which uses image analysis algorithms to track objects and avoid obstacles. Being software-based means that this functionality will get better and more refined as time goes on. There are different flying modes available including Sports, TapFly, Gesture, Follow Me, Terrain Follow, Course Lock, Home Lock and WayPoints. Terrain Follow and Gesture modes being the new editions. Sports Mode allows you to hit the top speed of the drone, while TapFly allows you to tap on the screen to tell the drone where to go. WayPoints allow you to set up GPS points for the drone to follow, while Home Lock and Course Lock are great ways to keep the drone orientated at all times. Gesture mode allows you to take selfies without the controller in your hand, which is very cool. All of these modes are there to help you easily get started flying the drone without having years of RC flying experience. The only real weakness in the design is the 3-axis gimbal, which can take a few knocks but still feels quite fragile. Over time you may need spares for the bands that keep the gimbal in place. The range of the Mavic Pro is excellent, boasting over four miles of range. And, using DJI’s video transmission system called OcuSync, at short ranges 1080p video and downloads at 40Mb/s for photo and video is possible. Battery life is also ultra important when it comes to drones. DJI claim the unit can hover for 24 minutes and fly continuously for 27 minutes. The highly continuous fly time is apparently due to the unit being optimized more for forward flight. You can expect a minute or so either way in real time, but you also get peace of mind from emergency low battery automatic landing. Keeping spare batteries on hand is always advised as it takes over an hour to charge the battery back up from around 10% of its charge remaining. The company continues to put out firmware updates and along with many different accessories, so this drone should last for a long time if properly cared for. Image stabilization is one of the key features to create quality footage, and the Mavic Pro does this with a compact 3-axis gimbal, shooting 4K video (3840×2160 24/25/30p) at 30p. The 1/2.3-inch CMOS sensor can also use Cinematic 4K (C4K) which bumps up the resolution to 4096×2160 at 24 frames per second. The camera has roughly the same specs as that on the Phantom 4. 12.7 megapixel stills can be shot in bursts even with exposure bracketing. With all the different easy-to-use flight modes, the unit can go full speed at 40 mph, with some reports of speeds being higher with a gust of wind behind you. This is as impressive as the bigger Phantom 4, but in a more compact design. The new Terrain Follow and Gesture modes give some nice extra functionality on top of what is delivered from the Phantom 4. Terrain Follow uses the drone’s Downward Vision System to follow terrain over different elevations. There are reports online of the units being taken to 17,000 feet before it automatically comes back to base, which means that the range should be adequate for most applications. The camera on the Mavic Pro is smaller, but has the same basic specs as the Phantom 4. The 3-axis gimbal maybe fragile, but it’s a feature that is missing from the likes of the Hover Camera Passport and Yuneec Breeze. The Mavic has a lot of features found in the Phantom 4 in a more compact design, just minimally different in some areas, like a 79 degrees of view in the Mavic and 94 degrees in the Phantom 4. The Mavic has gesture recognition software and adjustable focusing which the Phantom 4 doesn’t possess. As a comparison to the Phantom 4 the Mavic is cheaper, has more flight modes with a longer range and most importantly is far more portable. 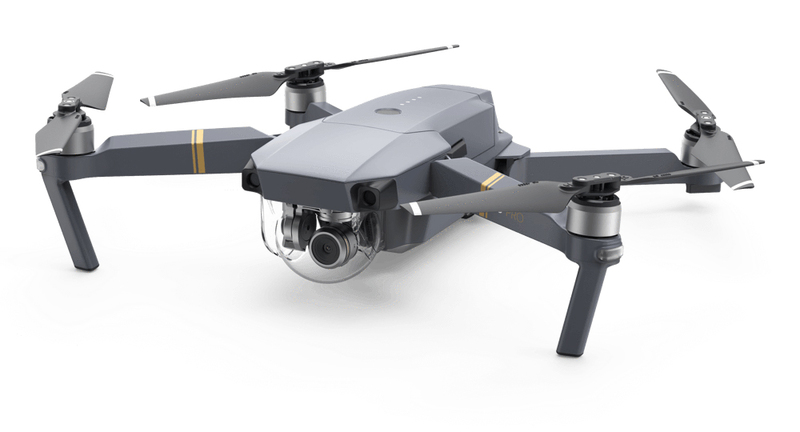 The Mavic Pro costs more than the likes of the Yuneec Breeze and Hover Camera Passport at almost double the price, but the Mavic has far more features, making it more dependable with more options if used on a daily basis. Yuneec’s Typhoon H has similar specifications and even has a 360-degree camera, but the Mavic Pro folds away and is more compact. In other words, the the Mavic Pro is a better choice all around. DJI has built a rock-solid performer in the form of the Mavic Pro. It may be more expensive than some of its competitors, but they don’t have anywhere near the functionality you need for flying in a large range of conditions.